Good news is that tonight (Sunday) Mike Birbiglia is doing another one of his all new “90 minute” sets at Union Hall. Tickets are only $7 and it’s a 9:30 show, after Tearing The Veil of Maya. And if that wasn’t enough, it seems that the young people’s comedy network, CBS, is giving Mike a shot at his very own show according the Hollywood Reporter. Look out Ray Romano, here comes Mike! 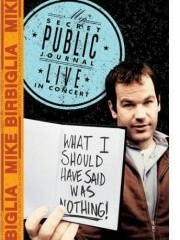 But wait, there’s more… Birbigs (that’s what his friends call him) is also set to release a new DVD, Mike Birbiglia: What I Should Have Said Was Nothing – Tales From My Secret Public Journal on April 8, 2008. Pre-order it now!